What is an incentive store? An Incentive store is exactly what the name implies. The students earn points based on their behavior at school. These "Falcon Bucks" are the incentive for the students to behave and turn in their work. 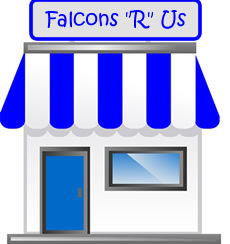 One day each month, the students can go shopping at the store with the falcon bucks they have earned. It is fun to see the students (even the 8th graders) get excited with their purchases. At holiday times, the students will shop for family gifts. ​What great "Positive Reinforcement" for the children! The store could use your help! We are always in need of donations. Look at the list below to get some ideas. Check your basement or storage locker for gently used items. When you are at the grocery store, buy a box of fruit snacks or soup cups. Replacement school supplies are always needed. Anything that a student might want to purchase is needed.